Blue Plaque Trail at Llantwit Major/Llanilltud Fawr Town TrailWalk around Llantwit Major and visit 13 historic sites that have been marked with Blue Plaques. Trail starts at the Town Hall. This was a Norman Manorial courthouse for the holding of the courts leet (tenants) and baron (freeholders) for the manor of Boverton and Llantwit Major. It was rebuilt under the lordship of Jasper Tudor (1485-95) and became a guildhall in the time of Henry VIII, the bailiff’s house. It was then leased in part to the St. Illtud’s lodge of the Oddfellows Society in 1845 and taken over by the first parish council in 1894. This was originally a Celtic site, founded by St. Illtud around 500AD, comprising a church, monastery, school and mission centre. The West Church was built by the Normans around 1100 and was extended into the East Church in the 13th century. The ruin at the west end is a Galilee chapel and a chantry founded by the Raglan family. The ruin in the churchyard was the chantry priest’s house. This 14th century house afforded entry into a cluster of farm buildings belonging to the grange of Tewkesbury Abbey. The grange was an estate also known as West Llantwit or Abbots Llantwit. After the dissolution of the monasteries it was sold to Edward Stradling and later descended to the Earl of Plymouth. On the south side the dovecot and remnants of the tithe barn are still visible. This house has a reputation of forming part of the Celtic monastery. It became the manor house of West Llantwit or Abbotts Llantwit, the land given to Tewkesbury Abbey by the Normans. After the dissolution of the monasteries, it was bought by Edward Stradling as his town house. It passed to Lewis of the Vann then to the Earl of Plymouth. It was bought by Dr. J.W Nicholl Carne who renamed it. This building has incorrectly been called Llantwit Major Castle. It is the ruin of a mansion built in 1596 by Griffiths Williams of Candleston for his daughter and son-in-law, Edmund Vann. Williams and Vann were lawyers, noted for conflicts with the local gentry. The family died out in 1695 and the house was abandoned. This is a late 15th century house with a southern wing added in the 17th century which incorporates many defensive features. From the time of its construction it was associated with the Nicholl family, who were the most prominent of the landed gentry locally, and which produced many distinguished representatives in the fields of medicine, art, law and the church. Also known as Ivy House, this was a 16th century town house, extended in the 18th century by Christopher Bassett. Later occupiers included Daniel Durell, Headmaster of Cowbridge Grammar School and Elias Bassett, who was a benefactor of Tabernacle Chapel. After his death the house passed to his niece and her husband, William Thomas, then to Illtyd Thomas, father of the antiquarian, Marie Trevelyan. The house was built circa 1450 by John Raglan (Herbert) and later occupied by Robert Raglan. The Raglans controlled many local offices as stewards and chantry priests. In the 17th century it became a vicarage for Stephan Slugg the notorious ‘Trimmer’ of the civil war period. It became a board school providing elementary education from 1874-1975. This was the first known domestic residence to be built following the destruction of the manor of Boverton and Llantwit Major during the revolt of Owain Glyndwr, about 1405. The house was built by John Baker Jack of England in about 1440. In the 18th century, as an inn, it struck copper coins and hosted monthly manorial courts formerly held in the town hall. It was rebuilt following a devastating fire in 1785. This was an early 16th century tavern. During the Civil War period the innkeeper, Edward Maddocks, struck brass tokens, gaining the house a reputation as a mint. Monthly manorial courts were sometimes held there including the last court leet. As an inn it entertained many celebrities in the 1930’s, including William Randolph Hearst, Marion Davies and the then Prime Minister Neville Chamberlain. This chapel was established in 1807 when Thomas William brought his congregation here from Burton, Aberthaw. The land had been purchased from Thomas Redwood of Boverton for five shillings. William was a Welsh hymn writer of great note and attracted a congregation from across the Vale. His work was carried on by Rev. Morgan Morgan who was also the post master at Boverton. Originally an Independent Chapel, it later joined the Congregational denomination and is now part of the United Reformed Church. This was originally the home of the steward of the manor of Boverton and Llantwit Major established by Robert Fitzhamon. It was rebuilt in 1597-8 by Roger Seys, Attorney General for Wales, but when the last heiress, Jane Seys, married Robert Jones of Fonmon the house was abandoned. 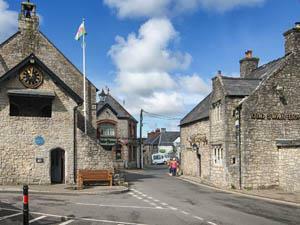 Walk around Llantwit Major and visit 13 historic sites that have been marked with Blue Plaques. Trail starts at the Town Hall. This cottage was built in 1862 on the site of an older building. The Ham, the main residence of the Nicholl family from the 16th century until 1921, was originally built around 1500 and was rebuilt in 1859-63 to plans by Victorian architect Matthew Digby Wyatt. It was destroyed by fire in 1947. Off the B4265 Barry to Bridgend road.